Review date: 2 May 2000. Big monitors are cool. But big monitors are also expensive. If they gave 'em away for nothing, we'd all be using 21 inch NECs or Sonys. But they don't, so we have to compromise. The question is - can you get a good-sized monitor for something vaguely resembling a reasonable price? And the answer, happily, is yes. Anybody who's glanced at a monitor price list will have noticed that 30% more screen real estate doesn't mean only 1.3 times the price. A 17 inch monitor will give you about 30% more viewable area than a 15 incher, but it's likely to be more than 1.6 times the price. And a 19 inch monitor beats a 17 by little more than 25% in viewable area, but it'll be 1.8 times its price, easily. Want a 21 incher? Not even 25% more screen than a 19 inch monitor, but more than twice the money, pal. The reason for this is simple enough. 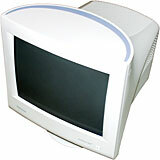 All conventional monitors are based around a Cathode Ray Tube (CRT), which is the last vestige of valve technology in common use. CRTs are evacuated - there's nothing in them but vacuum. They therefore have to be built strongly, of thick leaded glass (the lead's in there to reduce radiation emissions), to stop them imploding under atmospheric pressure. And the bigger the monitor, and the flatter the screen, the thicker the glass has to be. Make a CRT twice as big, and you need to use more than four times as much glass; keeping the dimensions of those big empty bottles to the very fine tolerances needed for a razor sharp picture is an expensive proposition. Just the same, though, a larger-than-usual monitor doesn't have to be that expensive. I've checked out a pair of 19 inchers - big enough to be impressive, small enough that they're not too far up the exponential price curve - from Samsung. The SyncMaster 900P is their standard 19 inch screen, and it sells for $AU950. The 900SL (for "Short Length") has the same size screen, but uses a considerably shorter picture tube, so it takes up rather less desk space. It costs $AU900. Both monitors can also have an optional USB hub fitted, which increases the price, but I checked out the plain versions. Samsung may not be the first brand name that springs to the average monitor buyer's mind, but it's certainly not a small manufacturer. Consumers here in Australasia mainly know Samsung for their cheap-ish whitegoods and TVs, but the South Korean corporation (home page here) makes all sorts of advanced electronics as well. Not to mention various more... adventurous... products, from their industrial/aerospace division, Samsung Techwin (home page here). Like, for example, self-propelled artillery pieces. C'mon, Sony. Let's see your tank. Back in the civilian arena, Samsung also make cathode ray tubes. Which is not something that all monitor manufacturers do. Many off-brand monitors have perfectly good tubes in them. That's because the manufacturers buy the tubes from a different company. This explains those ads for monitors described as "Fabulous Dragon 17 inch (Sony tube)". Samsung make their own tubes, and they make rather good ones now. They're conventional design shadow mask dot triad CRTs (I'll get to what all this means in a moment), with no ultra-flat faces or other fancy frills. But they're a fine choice for the money. Colour rendition good enough for all but the fussiest professionals, razor sharp focus edge-to-edge, and reasonable flatness to boot. If you simply must have a ruler-flat screen, then these aren't the monitors for you. But they're quite flat enough for my purposes, thank you. Particularly when you consider that a Sony G400 19 inch monitor (I review one here), which has an almost perfectly flat screen, will set you back almost three quarters again as much money as a Samsung 900SL. A dead flat screen is nice for two reasons. One, geometry is perfect - the corner angles of a triangle will always add up to exactly 180 degrees, not the slightly-more-than-180 you get on a convex surface. This isn't very important, though; your brain is very good at "flattening" a mildly curved viewing surface. It's so good at it, in fact, that looking at a truly flat monitor when you're used to a curved one is likely to give you the false impression that the edges of the screen curve towards you. The other advantage of a truly flat screen is that it reflects less of the room, so glare is less of a problem. The more curved a screen is, the wider the reflected view you see in it, and the more lights and windows you're going to have to try to avoid seeing. 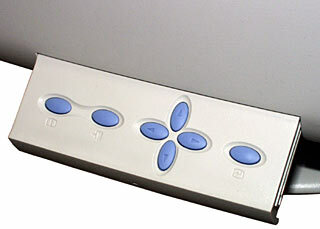 But pretty-flat monitors like these SyncMasters are, for most people's purposes, near enough. And so much cheaper. Both 900-series monitors have the same sized screen. Samsung quote the "normal" display area as 352 by 264mm (13.9 by 10.4 inches), and the "maximum" display area, with the image goosed right out to the edge, as 366 by 275mm (14.4 by 10.8 inches). This, for the mathematically disinclined, adds up to just about exactly an 18 inch viewable diagonal. Samsung are sticking to the current level of honour among monitor makers by quoting their monitor sizes as only one inch higher than what they actually are. For a "19 inch" monitor, the 900P's not unusually big. It'll take up a 468 by 499 by 483mm (width by height by depth; 18.4 by 19.6 by 19 inches) chunk of your room. The 900SL's a little shorter, a little narrower, and a lot less deep. It measures up at 460 by 462 by only 407mm (18.1 by 18.2 by 16 inches). The width and height difference is unlikely to matter to you, but the three inch depth difference is another matter. The biggest problem with most giant screens is that many users find they need space behind their desk for the monitor's derriere to jut out. If there's a wall there, you end up mashing the monitor against it, and probably still have to put up with a monitor that's closer to your face than you'd like. Here the two monitors are, viewed from above. The 900SL is only as deep as most cheap 15 inch screens. This pleasing compactness is achieved by Samsung's use of a "short neck" CRT for the 900SL. There have been quite a few of these compressed CRTs, and early models weren't very impressive; the greater electron beam divergence they needed to paint the whole screen meant they often had crummy geometry and/or focus and/or uniformity, and/or the manufacturers made things easier on the beam by giving the tube a more curved face than their longer models. The 900SL, however, is a rather newer monitor than the 900P, and its tube is, if anything, better quality than the older and more expensive model. The 900SL weighs a bit less than the 900P, too; it's 21.5 kilograms (47.4 pounds), while the P's 22.5kg (49.6 pounds). This puts them in the "transportable" category; it's no big deal to shift them from desk to desk, but if you're not quite a knobbly sort of person, you're not going to be moving 'em a great deal further. 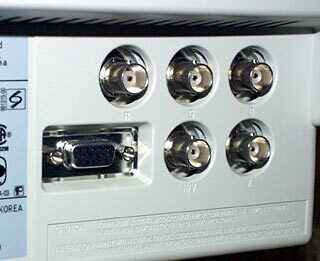 Like every serious monitor, the SyncMasters both have an ordinary 15 pin VGA connector on the back, and a set of BNC connectors as well. Quality monitor cables that terminate in BNC connectors give a slightly better image, especially in very high resolutions. Beware of cut-price BNC leads, though; the purpose of the exercise is to maximise signal separation between the different conductors of the cable, and cheaply made, poorly shielded BNC cables will give you a worse picture than a good plain VGA connector lead. This is the back of the 900P. The 900SL's rear panel is only slightly different. Both monitors have the full suite of geometry and colour control options. All of the fancier options are accessed via an on-screen menu that's quite well designed, as these things go. I've seen worse. Much worse. The 900P is the show-off of the pair; its controls are on a "tongue" that slides smoothly out when you push on it. The 900SL's buttons are, less glamorously, just mounted on the front panel like practically everyone else's. The Samsungs aren't perfect. They both exhibit some of the standard problems of cheaper screens. For instance, their geometry and grey levels change noticeably when the screen contents change - if you've got a document in a window covering one half of the screen, and the other half's covered by a window that changes brightness dramatically, then you'll see everything shift position and appearance a little. You can see this phenomenon for yourself, if you're using a similarly less than ideal monitor - let's face it, you probably are. Play with windows with strongly contrasting brightness, and watch the screen edges as you pop differently coloured things to the front. Old, cheap monitors often change the image colour dramatically, and let the image hop all over the place, when you do this. The Samsungs aren't nearly as bad. But the effect is still noticeable. Between the two of them, surprisingly, it's the short-neck, lower-cost 900SL that gives the higher quality picture. Its newer picture tube makes the difference; Samsung managed to make it better, as well as shorter. If you're a professional graphics person, uneven brightness is unacceptable. If you're practically anyone else, then it's no big deal. I do quite a big of Web graphics work, and it doesn't bother me a bit. The gamma calibration doesn't end up being all it should be, but it's quite close enough, thank you. The uniformity of the Samsung screens - how evenly bright they are - isn't fabulous, either. 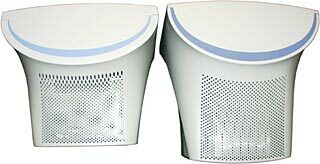 They certainly don't have any real "hot spots", but they're not up to the standards of true professional monitors. Current professional monitors, though, have very high standards. You don't quite need a light meter to be able to spot the Samsungs' uniformity problems, but it's a close-run thing. Lots of current monitors can display very high resolutions at a useful refresh rate, and the SyncMasters are no exception. They can both handle a maximum resolution of 1600 by 1200, at a 76Hz refresh rate. Since 72Hz is the refresh rate below which most people start to notice flicker, the maximum resolution should be quite watchable for pretty much everyone. Some people prefer higher than 80Hz refresh rates, but most have a hard time telling the difference. Many cheaper monitors only support a 60Hz refresh rate for their maximum resolution. 60Hz is flickery and nasty. In days of yore people tolerated far worse (hands up everyone who ever used an Amiga in interlaced mode), but 60Hz is still less than palatable even for games, and no fun at all for business use. Looking at the maximum numbers is about all that most people do when they're comparing monitor resolution capabilities, but you should take one more step, lest you discover too late that your maximum resolution isn't actually good for much. You should look at the dot pitch. The dot pitch is the distance between phosphor dots of the same colour on the monitor's screen, expressed in millimetres. 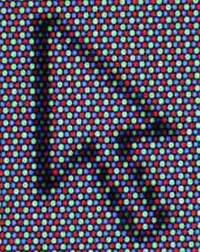 The closer together the phosphor dots are, the sharper the monitor's display will be, and the higher the resolution it will be able to clearly display. The maximum resolution a monitor's electronics can accept is, commonly, rather higher than the maximum resolution its phosphors can sharply display. And such is the case with both SyncMasters, since their viewable areas are the same, and they also have the same dot pitch. Samsung like to quote horizontal dot pitch, which is somewhat misleading. It's the horizontal distance between phosphor dots of the same colour. 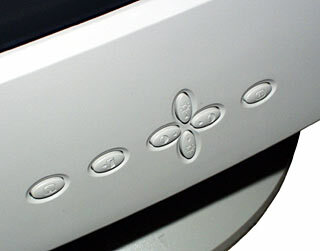 But the SyncMasters, like most monitors, use equilateral-triangle "dot triads". A dot triad is a red dot, a green dot, and a blue dot - the smallest section of the monitor's face that can accurately display any given colour. This photo has been taken with a short exposure, to darken the dots and make the shadow mask gaps between them more obvious. That's a standard Windows mouse pointer, with the monitor set to 1600 by 1200. Since you can't get from any dot to any of its nearest neighbours of the same colour just by moving horizontally, the horizontal pitch measurement underestimates the real dot pitch of the monitor. The geometry involved's simple enough; if the horizontal component of the dot pitch is, as Samsung say, 0.22mm, then the real dot pitch is a less exciting but still good 0.25mm. What does this mean? It means that, on the 366 by 275mm absolute maximum display area of the 900SL and 900P, you can fit about 1170 by 880 pixels, before you have more than 1.25 dot triads per pixel, which is the generally agreed point where "somewhat fuzzy" becomes "too fuzzy". So 1024 by 768 will be sharp, 1280 by 960 will be noticeably fuzzier, and higher resolutions - definitely including the maximum 1600 by 1200 - will be fuzzy enough that individual pixels won't render properly. The dimensions of the Windows pointer in the above picture are 11 by 19 pixels. It fuzzes its way onto about 36 rows of phosphors; at two dot-rows per triad-row, that's only 18 triads per 19 pixels. The actual number of dot triads on the 900s' screens works out at 1464 by 1100. This, by definition, is the theoretical maximum number of discrete pixels the screen can display. In reality, because the rectangular pixels don't map properly onto the hex array of dots, you use the 1.25 divider to get an idea of the true resolution. All this doesn't make the higher resolutions useless, of course. 3D games look fabulous in super-high resolutions, provided of course that you've got the godlike graphics card needed to shift the amazing amounts of data required for high resolution, high frame rate 3D graphics. But please don't do the standard newbie-big-monitor-owner trick of selecting some monstrous resolution for normal day-to-day computing, just because your monitor and video card can support it. You'll either give yourself migraines trying to read teeny, fuzzy text, or be forced to defeat the purpose of the exercise by winding up your font size. The SyncMaster 900P's a quite nice screen. I wouldn't object to being made to use one all day. But there are many other monitors as good, or better. The 900SL, on the other hand, combines a daintier footprint and slightly lower price with somewhat better image quality. Unless you really, really dig the 900P's funky slide-out control panel, the choice is clear. How good is the 900SL? They didn't give it to me for nothing. I paid. If you knew me, this fact would really impress you. 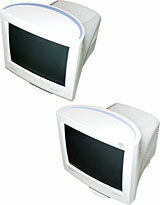 Aus PC Market don't sell these monitors any more, but they've got lots of others!